Innovative functions for object detection, color detection and code reading: SensoPart is treating its VISOR® vision sensor family to a comprehensive update. Users of SensoPart’s VISOR® vision sensors have reason to smile: The 2017 update offers significant functional upgrades for all product versions – VISOR® Object, VISOR® Color, VISOR® Code Reader, VISOR® Solar and VISOR® Allround. Objects to be inspected are not always in the same position, which is why the VISOR® offers several tracking methods: contour-based position tracking reliably detects any parts that are out of position and ensures that subsequent inspections are always carried out at the right place. The edge-based position tracking function offers new features, with a performance that is unique on the market of visions sensors. It detects objects that have undergone a slight rotation (by up to approx 30°), without the need to teach a sample or contour. It is therefore suitable for very fast processes, such as conveyor belts or for use with wobbling parts. Position tracking can now be disabled separately for each individual detector so that, for example, parts can be counted regardless of their position. The functional scope of the contour and BLOB detectors has been extended with VISOR® Object. The contour detector now has an additional multiple detection feature: up to 200 instances of an object can be identified in one picture, simplifying counting or pick-and-place applications. The BLOB detector’s new “Circle fit” function detects the smallest deviations from the nominal contour of circular objects, enabling, for example, the identification of bottle caps with a broken security ring or deformed lids. There are three significant new functions for the VISOR® Code Reader. “Autotune” allows very easy configuration of poorly visible codes or codes that are difficult to read, e.g. soiled. This previously required the manual fine tuning of parameters; now the sensor identifies the optimum parameter setting automatically – a unique feature in this sensor class. The second function is called “Multitrigger” and facilitates code reading on parts with fluctuating surface characteristics. Here the VISOR® Code Reader automatically takes up to 100 pictures with different exposure times until the code can be read properly. This avoids the need for additional programming work in PLC or machine downtimes due to illegible codes. The third new feature is the use of OCR to read texts on rotated objects with contour-base position tracking. The range of functions of the VISOR® Color vision sensor has also been extended. The user can now define virtual color filters, which highlight the relevant area of the picture and mask unwanted sections. 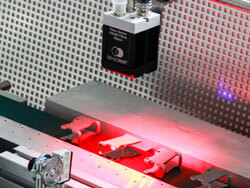 This achieves maximum contrast in a simple and reliable inspection task solution. The virtual filters can be configured separately for each individual detector, providing much greater flexibility than with optical color filters. The VISOR® Allround vision sensor benefits from the complete range of new features, combining all the functions of the object sensor, code reader and color sensor in one. Simplified sensor management for multiple sensors in large plants has also been introduced for all VISOR® products. Users can create their own favourites list in the software, which provides a clear overview of all the sensors in different areas of the plant. The 2017 software update is now available for download by VISOR® users on the SensoPart website. The sensor manufacturer SensoPart, based in Wieden near Todtnau, and also in Gottenheim near Freiburg since 2001, develops, produces and sells sensors for industrial applications. The main focus is on optoelectronic sensors, particularly laser sensors, which are used in so many industrial applications, and high-performance vision sensors for the detection of objects, colours or data matrix codes. The past years have been marked by a strong growth in turnover and the regular launch of new, innovative products. SensoPart has received several distinctions for its work, for example the Dr. Rudolf-Eberle Prize, 1st place in the BadenWürttemberg Prize for the Promotion of Young Companies, and has been awarded the German Sensor Application Prize several times.